Wake up in the morning, and throw open the curtains of your hotel room. An incredible view can have the same invigorating effect as a cup of strong coffee. Take a deep breath of the fresh air, and watch the colors dance in the sky as the sun comes up. Delaware has perfect places to do just that at these hotels that have rooms with a view. You can find the right vantage point to get your day off to a refreshing start in two kinds of rooms at the Boardwalk Plaza Hotel. Its oceanfront rooms run directly along the beach, and its ocean view rooms provide views of the horizon. The Concierge Level, which is adults-only, offers guests use of a private rooftop deck that has 360-degree views of the beach and downtown Rehoboth. Nearby Henlopen Hotel has an open, central courtyard where you can view the water from the decks of its exterior and interior rooms. Atlantic Sands Hotel and Conference Center not only has many rooms with expansive views of the water, it also has a pool right along the boardwalk that also looks out onto the ocean while you swim. In Dewey Beach, you have two view options – ocean and bay. Surf Club Oceanfront has kitchenette efficiencies and a three-bedroom house next door that is also rentable. They all have uninterrupted, panoramic views of Dewey Beach, consistently rated one of the cleanest beaches in America. The rooms at Bay Resort Motel look out over Rehoboth Bay. While beach-view rooms showcase inspiring sunrises, this hotel’s bayside rooms have their moment at the other end of the day as the sun sets and the fun of Dewey’s nightlife kicks into gear. While the Cottages at Indian River Marina have spectacular views of the Indian River Inlet, they also include a view of something nowhere else offers – the stunning Indian River Bridge, which lights up at night. The rooms with a view are especially plentiful in Bethany Beach. That includes the newest addition to Delaware’s batch of hotels that face incredible scenery. 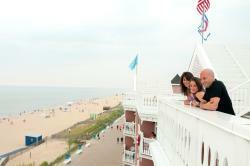 Bethany Beach Ocean Suites has more than 100 rooms all with private, beach-view balconies. Bethany is also home to ResortQuest by Wyndham Vacation Rentals, which has dozens and dozens of rooms in multiple buildings that look out onto the ocean. If you are looking for a slightly different experience from the ocean or bays, Delaware has hotels with extraordinary views for you, too. Lewes has The Inn at Canal Square, which sits on the Lewes-Rehoboth Canal and has sweeping views of the waterway, the marina and the wharf. In northern Delaware the new Westin Wilmington provides views of the meandering Christina River and the heart of the city’s vibrant downtown. Make your reservation today at any of these hotels, and you’ll soon be lost in the beauty of the endless sights from your room, a room with a view. 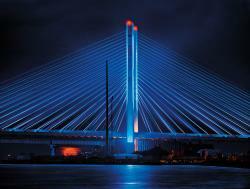 View an interactive map of Delaware to help plan your trip. Search for hotels, restaurants and things to do. Delaware’s beaches let you pick your flavor of fun, whether you prefer the laid-back life or lean toward less quiet pursuits.